“Patrick from Belgium” sent me a message that he had a mint Compact 945. I was initially skeptical, wondering if he simply meant a Jericho. Man, was I wrong! Yes, that’s a retail box, which means that these guns were very, very late in the product release process before being cancelled. Patrick told me he had acquired his from his local IMI-affiliated dealer in Belgium once upon a time. 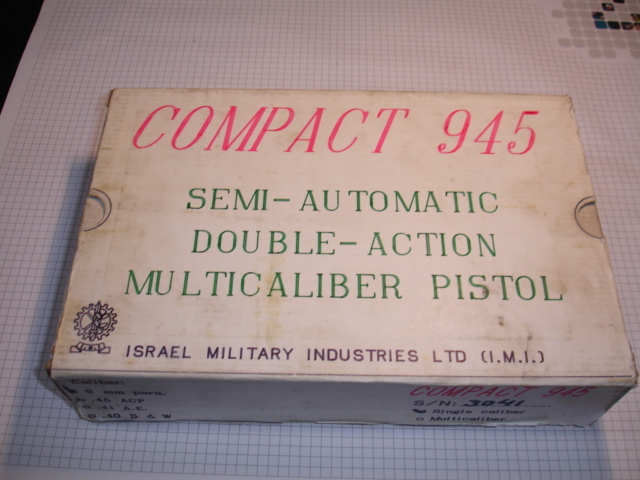 The S/N on the box (and gun) is 3041. 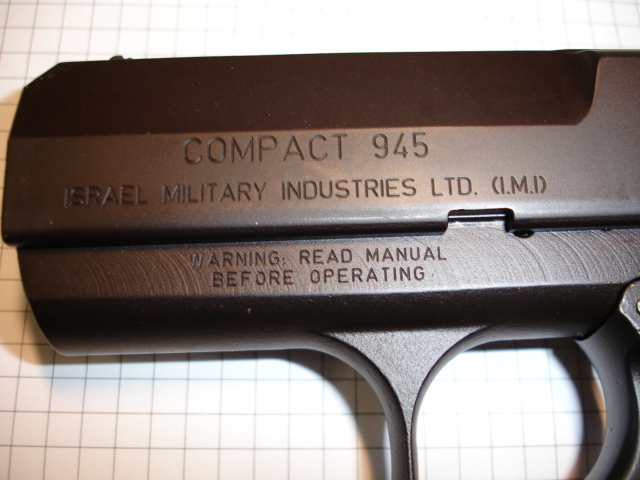 For reference, the S/N on the Compact 945 from the Modern Gun magazine is 3050, and that was stated to be a pre-production sample. So, Patrick’s gun would seem to be an extremely early gun, especially if the serial numbering started at 3000 (which I think is likely given the other evidence). Nothing unexpected on this part of the slide. Now things are getting interesting! 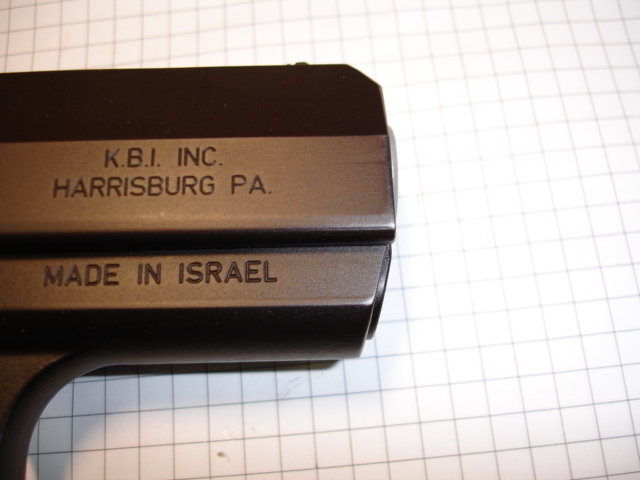 KBI was the first to import IMI’s Jericho pistols, and it seems like IMI was planning on using them to export the Compact 945 as well. I’ve emailed Mike Kassnar to see if he has any information he can share. Recall that in the Modern Gun magazine article, this KBI “billboard” is blanked out in all the pictures, so it’s possible IMI jumped the gun on putting the KBI banner on it (ie, they didn’t have his permission yet). The magazines are 1911-compatible, as I previously theorized. The top picture you see there is a standard 1911 magazine. 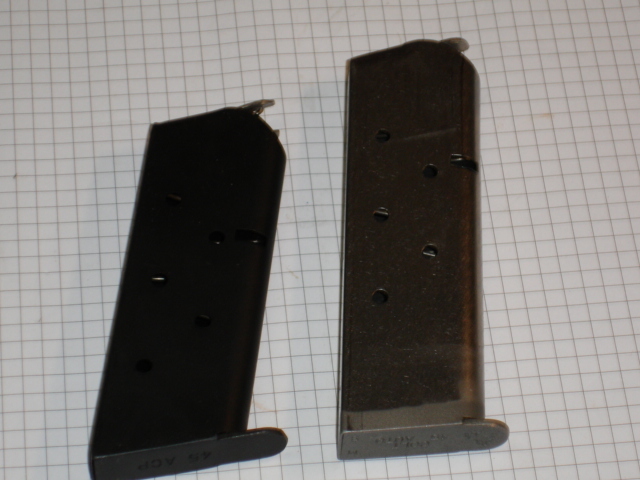 The picture below is the .45ACP Compact 945 magazine next to a standard 1911 magazine. I’m guessing it’s an Officer-sized magazine. I wasn’t going to ask Patrick to field strip his gun, but he provided me the next best thing: scans of the instruction manual! I am happy to provide the compact 945 manual (PDF) for you to read. We can glean a LOT of information from this manual. The front of the manual is marked as “preliminary issue”. You could interpret this as “first run”, but it could also mean it was a sales sample. 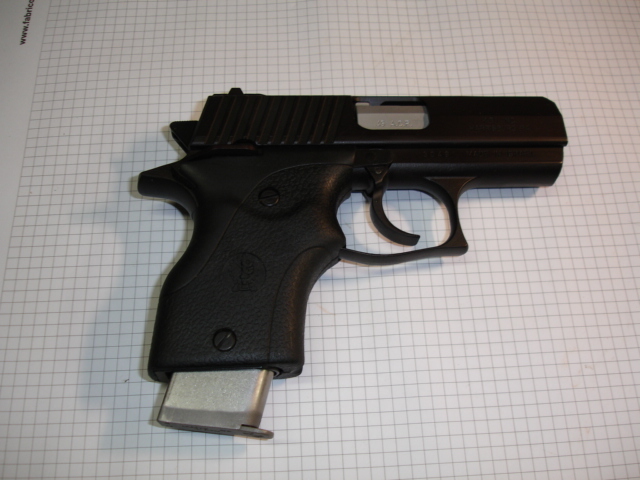 This gun was intended to be caliber-switchable using conversion kits between 9mm, .45ACP, and .40S&W. Both of the examples of this gun that I’ve seen are .45ACP, but perhaps there’s a 9mm version floating around? According to the manual, the conversion kits would have consisted of a barrel, supporting plate, magazine, and extractor. The slide is certainly unique. It’s two parts – the outer slide and the inner bolt which has the cartridge face. You can adjust what caliber of cartridges the bolt supports by swapping / rotating the supporting plate on the side of the bolt and swapping the extractor. This appears to be a tool-less operation. I’ve never seen this system on another gun, and it’s really quite clever. 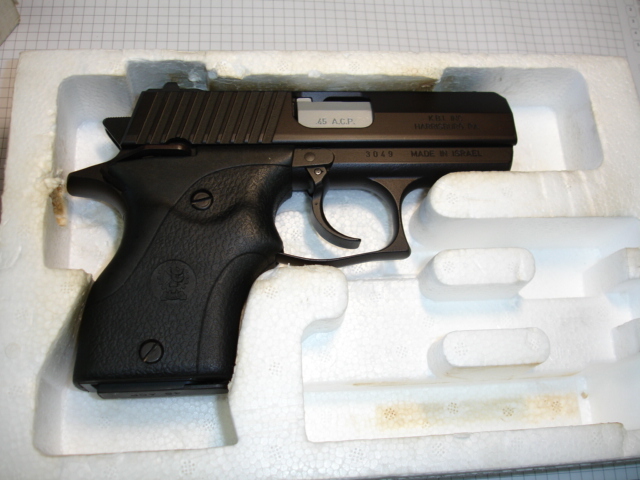 The action is also closer to the Sig P226 than the CZ-75. This is the first time we’ve seen the barrel, and there are no lugs on it. It appears that the enlarged breech locks into the pistol’s ejection port. This is a perfectly reasonable locking method, but it’s not something we’ve seen out of IMI before or after. I can only theorize why IMI would cancel this gun so far into its production and marketing process. The Compact 945 was clearly ready for mass consumption. Was the gun too costly to produce due to the complex slide/bolt design? Did IMI or KBI decide it was too heavy for the US concealed carry market? Did the introduction of the Glock 26 in 1996 cause IMI or KBI to rethink their plans in the compact pistol space? I’m not sure we’ll ever know for sure.